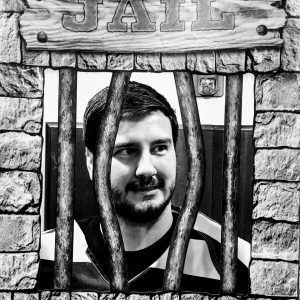 On Wednesday 12/6/17 our Director of Business Development was locked up behind bars…but he hadn’t done anything wrong. Alex Williams was volunteering for a faux prison sentence in order to fundraise “bail” money for the Muscular Dystrophy Association (MDA). Muscular dystrophy is a group of disorders characterized by a progressive loss of muscle mass and consequent loss of strength, for which there currently is no cure. Organizations like the MDA are researching potential cures including, but not limited to, gene therapy, altering protein production and stem cell research. Money raised through fundraisers like this go towards improving the quality of life for individuals with muscular dystrophy as well as prevention.